Here are a couple of videos of Taira Sensei demonstrating the bunkai of Seipai kata. The first is a demonstration from a national geographic TV show. The second shows what is demonstrated in the first, but broken down and referenced to the kata. One of the things I like about this is the range. Notice how close they are and then compare that with the lunging punch from 10 feet stuff often presented as “bunkai” in many dojos. This is all done at a realistic distance. Also notice that both hands are constantly busy striking or clearing the way for strikes. No “dead hands” and no putting the hands on the hips or across the chest for no apparent reason (or explained away as “guards”). It’s an interesting watch and I hope you enjoy it. Taira Sensei skill and power is there for all to see, great karateka IMO. The drill in itself is not for me, to 'fixed', to long and one sided- however kudos for the pesentation and the work it takes to get to this level of delivery. We do have a very long drill, aprox 250 techniques, but it is 'broken' in terms of timing and distance, and is not based on any one kata but on the strategy and techniques of our Ryu, it involves entering, going round, going forward and going back at an angle etc etc - whilst the drill in itself is outstanding IMO the actual benefits are in all the bits - the stringing together is simply a matter of memory and practice. The drill in itself is not for me, to 'fixed', to long and one sided- however kudos for the presentation and the work it takes to get to this level of delivery. I’m not a fan of overly long drills either, but the way I viewed it is that the “long demo” was for the cameras and that it was simply the separate pieces shown in the other clip put end to end? What I mean is that I saw the first clip as a demo to give a nice visual for the good people of National Geographic; as opposed to a dojo training drill. That’s just an assumption based on the cinematic way it is filmed and perhaps those here who are more familiar with Taira Sensei’s teaching could comment on how he teaches and trains these things in actual practise? I do like the “one sided” nature of it though. Uke’s attempts to protect themselves are neutralised as Taira maintains dominance and does not let the other guy back in. I like the mindset of “destruction not duelling” and in that regard it is similar to some of our drills. However, I also like our drills to include and encourage fleeing when the enemy has been engaged such that it safe and effective to do so. Longer drills can counteract that, but so can back and forth drills. I find how people drill to be every bit as important as what they drill. Fascinating to see how other people do things and have the merits of various forms of practise discussed. Sounds fascinating! Any online demos or extracts we could view? Notice how close they are and then compare that with the lunging punch from 10 feet stuff often presented as “bunkai” in many dojos. Isn't that whats happening in the second video? Isn't that what’s happening in the second video? It is for the first motion (which is one of my reservations with it), but once the range is close it stays close. I really dislike “bunkai” which has people stepping back and forth to maintain the artificially huge distance and that’s what I was referring to. What’s interesting is that in the first video he starts close and stays close and I much prefer that to how things are started in the second video. Either way, once enganged the range is as it should be in my view. I was once told by Grandmaster Oyata you can never remember what to do when practicing 250 techniques cause it takes the brain about a sec to decide what to do and by that time you will be hit,he told me to take three moves that work for me of a punch,push or a finger in the face and practise them until I have mastered them and they will come to you like when you sneeze, you cover your mouth,its a reflex cause you do not think about doing it you just do it and I remember the first time I got into a situation about three or four things were running through my head on what I was going to do,when it came down to it none of the things I thought about did I use to take my attacker out but something I used for years in the dojo did i drop my attacker with one hit. Plus the first video started from a two handed grab, maybe the second vid was for a different audience where Taira Sensei thought it would be better shown or understood. re our long drill no reference to it online and the only way anyone outside of our Ryu gets to see it is to come train, it's not secret just personal to the Sensei who created it. It has little/no value as a string of 250 techniques, it does when broken down into 2-4 movement pieces, it contains the practical strategies, techniques and variations of our Ryu in application, and is different from the solo classical kata structurally. It also is 'active' from the attackers perspective, giving them clear openings to take advantage of, which are quickly closed down, it is preemptive at times as well of course, it works all different angles and timing/distance variances, I like it alot but it is what it is! I've just "pruned" the thread to remove a side discussion on kiai. I like to keep things on topic as far as I can and, seeing as the side discussion was unrelated to the main topic, I've removed it. Please feel free to restart as a separate thread. Understood. It does sound very interesting and thanks for describing it and adding your related thoughts to the discussion. I appreciate it. Adding a comment a few years later. Old school Goju, which Taira Sensei is going back to teaches you should be able to take any individual technique, pull it out and use it in a variety of ways, then it also teaches how to chain the techniques in a kata to try and drive and keep pressure on your opponent, so always work to use them on an uncompliant one. One thing to keep in mind though. There's a reason most katas only chain 3-4 techniques in any direction. You know the philosophy "over in 3" (or less). If a series of moves goes beyond that, it's only if you've managed to tie up an attacker or are able to put him on his heels and keep him there. If he can disengage during that time, you shift to something else. So when you see many moves in one direction, look for how you are dictating to your opponent- an uncooperative one. It's easy to chain techniques when you have a compliant uke. Before I go on, when I say "end" a self defense situation, it means to either disable the attcker OR to create an escape route and get the hell out of there using the Nike defense :). I teach self defense should be over in 3 or less. If it isn't over after the first 3 you don't adopt the attitude this is going to be a fight, rather, you have the attitude, I'll end it in the next 3 or less. That is always your goal, to end it as quickly as possible, not to accept that you will need to make this a long drawn out battle. Part of the reason I decided to train in only one kata was to narrow the scope of my techniques, so I didn't have to think about what I was going to do, because I would already know what I was going to do. It also helps that all the techniques of any particular kata should work in concert with one another, so they feed into one another and switching techniques becomes very natural. For instance one of the arm bars in my kata can flow into another joint lock if the person manages to keep their arm bent flowing with the resistance of the person. 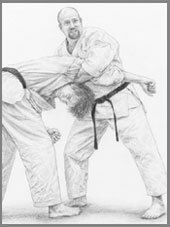 Alternatively if the armbar works than the beginning motion is a punch to the temple, followed up by a hammer fist to the back of the head in case that doesn't work, or if neither works it can be an upper cut to the under side of the chin followed by a backfist to the neck when their head goes back. Besides that I love watching Taira sensei do his stuff, I just think he looks so fluid and forceful at the same time, you can tell he knows exactly how to move his body to put the most energy into all of his techniques. I totally agree with that. It’s not just what he does, but how he does it too. Great karate! The videos seem to have disappeared? They are all still there. It’s just that they were emended a long time ago, before https was the standard. The videos are embeded with YouTube http links, so they will be blocked by some browsers. If you click on the “padlock” at the top of your browser and allow all content they will reappear. I have a fantastic video DVD of the Carlsbad seminar (Paul Enflied) where Taira demonstrates sepai in freely improvised free-form shadow-sparring way. I would love to share that short snippet here. I will see if I can get in touch Paul Enfield Sensei and ask if I can post it. What it shows that excites me is his complete understanding of the kata as a fighting system in itself. It's really very imprssive. I've had the great pleasure of training Taira Sensei - he really quite something.